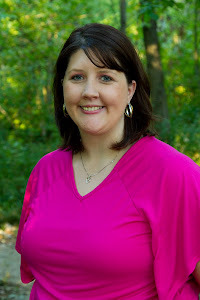 I have been trying and trying to come up with a Make Your Home Sing post today that went along with my food/grocery theme this week, but I have struggled greatly! Alas, finally, I came up with one! I have been needing to get these done and have been putting it off and putting it off... 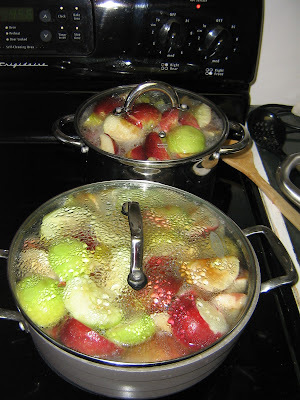 Therefore, this week my home will be singing a song about smelling like apples! There is nothing like the smell of apples and pumpkins in the fall. Why is that I have more memories pop into my head when I smell something rather than see or feel things? When I smell apples, I think of a warm house in fall and I just get giddy with excitement! Okay, okay... I digress.. This week I will be working on getting the last of my apples up. 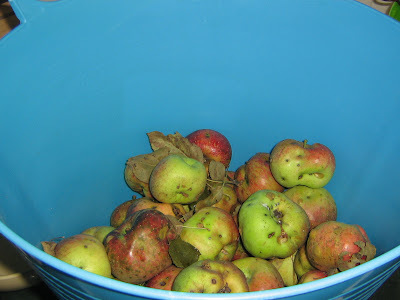 I will be making applesauce and canning it and I will be chopping apples and freezing them for fried apples. These are apples from the family farm. We do not choose to spray, therfore these are A LOT of time and work to work up. Remove stems, leaves, and clean thoroughly. Core, peel and slice. I keep the skins on the apples because I have a handy, dandy Kitchen Aide mixer attachement that skins the apples for me. Cook apples until soft. 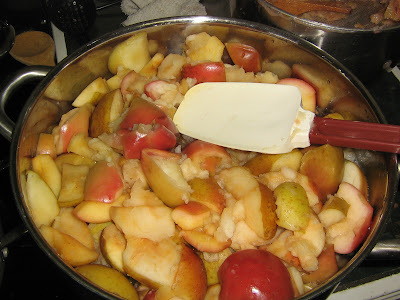 If I am not using the attachment, I add about a tablespoon of lemon juice to the water to keep the apples for browning. Then take a potato masher and mash the apples. 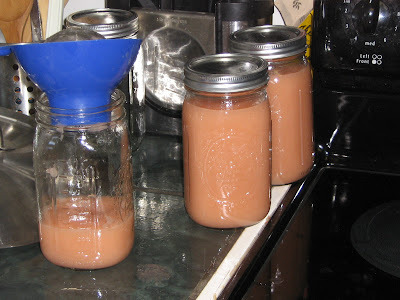 Spoon applesauce into jars. 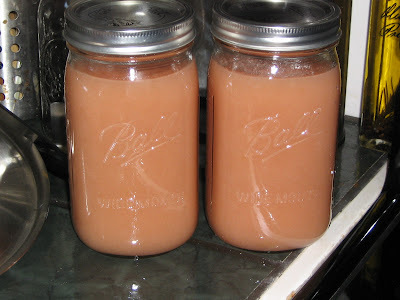 Take knife and push down side of applesauce to remove air bubbles. Wipe the rim of jar to make sure nothing is in the way of sealing. Place lid and then ring on jar. After you put the applesauce in the jars, remove air bubbles, wipe jar rims, and put on lids and rings, the applesauce needs sealed. Some people freeze their applesauce, I choose to can it. I don't really have a lot of freezer space so this helps. Put the jars in the water bath and bring water slowly to a rapid boil. When a rapid boil is reached, let the boil continue for 15 minutes. After the 15 minutes, turn off heat and allow to sit. When the jars are cool (I let mine sit overnight) remove rings and make sure lids sealed. Applesauce is good, if sealed properly, for 3 years. This is linked to Moms The Word's Make Your Home Sing Monday. Looks wonderful. A home definitely sings when the smell of apples are in the air. My parents just came down from Maine and brought a bunch of fresh Macintosh apples which are PERFECT for making applesauce, so that's what I did a few days ago! My kids are loving it! Wow, I have never canned in my life, but I love it when other people do. My mom used to, and my sister still does. I just think it would be awesome to eat something you've canned! oh, and thanks for linking up today!